The City of London’s Planning and Transportation Committee, recently backed an ambitious Local Plan ‘City Plan 2036’ This marks a move to improve the quality of the environment of the Square Mile. Furthermore, it recognises the need to deal with the pressing issues of climate change, health and wellbeing. The Local Plan presents a vision to 2036, with outlines of plans to deliver sustainable development in the City. This ranges from creating space for businesses to grow and improved transport and servicing. Of course it also seeks to conserve the historic environment whilst also making healthier streets and a vibrant culture. It also addresses the issues of tall buildings and protecting views. But importantly from a greening perspective, it embraces the need for better green infrastructure within the square mile. This is where the urban greening space factor comes in. For the first time, there will be a policy on urban greening. The city will require all new developments and refurbishments to include a greening element to buildings and/or public realm. The purpose, of course, aims to improve biodiversity, rainwater run-off, and air/noise pollution and urban temperature regulation. Ultimately this will ensure that the City is a more desirable business location. The UGF tool will underpin efforts to ensure that all new development contribute towards urban greening. GIC produced the evidence and the method for the city’s UGF. And we are please that this is the first local plan to embrace such a factor at policy level in London. The Urban Greening Factor helps planners to better understand planning applications in terms of green space and green infrastructure. It is based on similar schemes which began in Berlin and have been copied in Scandinavia and a few US cities. Essentially, it is a tool that assigns scores to green infrastructure elements. The lowest scores are for sealed surfaces and highest for natural features on deep soils. A simple calculation gives a site an overall score, with authorities able to set targets. In the City of London, the emphasis is likely to be on a voluntary approach, whereby the Urban Greening Factor is used as a tool to aid discussions between applicants, planning departments and stakeholders. This will ensure that the importance and value of green infrastructure are not overlooked. In fact urban greening including green roofs, green walls and terraces/balconies on taller buildings, will be further embraced by designers. For the first time, there will be a policy on urban greening. The city will require all new developments and refurbishments to include a greening element to buildings and/or public realm. The purpose being to improve biodiversity, rainwater run-off, and air/noise pollution and urban temperature regulation. Ultimately this will ensure that the City is a more desirable place to work and visit. Our work on the UFG came out of our support for the Mayor’s Urban Greening Factor. 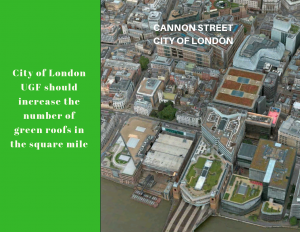 This was undertaken in partnership with TEC and Temple and was part of the evidence supporting proposed Urban Greening Policy G5 in the Draft New London Plan. As more London Borough’s take up the UFG we are sure the whole of London will benefit. Because London will become a greener and healthier place to live, work and visit. The measurement of the Urban Greening Factor is one of the outputs of the GREENPASS software, which GIC will be introducing to the UK with its Austrian partner Green4Cities in 2019.